UPDATED: February 12, 2019 – Managing doctor’s appointments, prescriptions, and budgeting medical expenses can be difficult. The Department of Veterans Affairs made it easy to manage my VA benefits online with myhealth.va.gov. 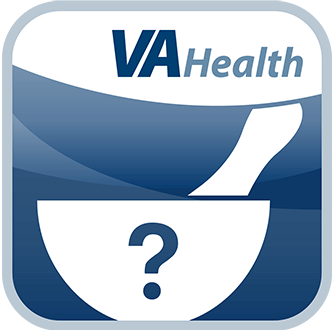 The My HealtheVet online VA portal provides access to a variety of resources and tools to help manage your benefits. This includes access to personal medical records (Blue Button), prescription refills, schedule doctor’s appointments & contact doctor thru secure messaging. Save time and trips to the pharmacy when you manage your healthevet prescription refill online. View current medication and supplements, request refills, arrange medication delivery right to your door and schedule refill reminders via your myhealthevet login. View your appointment history and scheduled appointments with the Veterans Affairs Medical Centers. View the time, date and location of each appointment, set up appointments reminders, as well as contact your health care team to cancel or reschedule an upcoming appointment via the My HealtheVet secure messaging feature. Stay informed and stay connected to your health care provider with the secure message feature. Contact your doctor or local clinic with any questions regarding upcoming appointments, medical test results, medications and treatment options. The Blue Button provides instant access to myVAHealth and your electronic medical records, allowing you to view, save, print, download and share your records with doctors, pharmacies, family members, other medical providers, etc. Click the Blue Button to download your medical records. 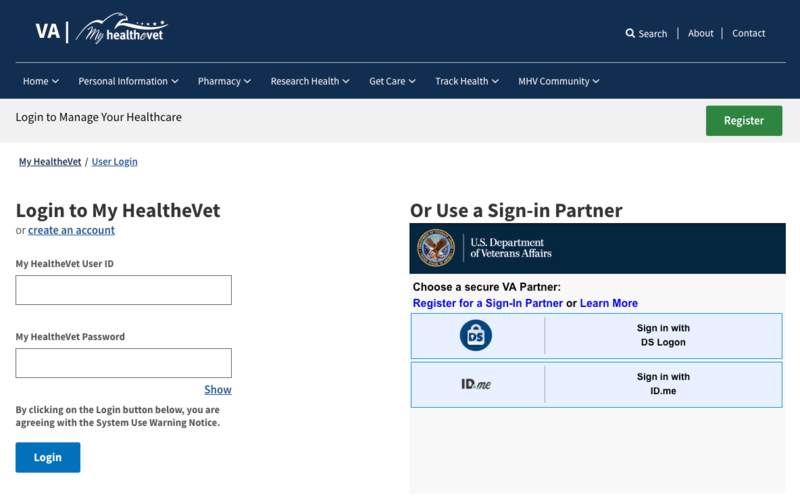 To access MyHealtheVet login, visit the homepage at www.myhealth.va.gov to access the VA portal. Learn more about the features and tools available with your online account below. Visit myhealth.va.gov and click the ‘Not registered’ link on the right-hand side. Enter in your personal information, relation to veterans affairs, contact info, preferred user ID and password with reminder questions. During registration, you will be given the option to choose from three different account types; Basic, Advanced & Premium. Once complete, your information will be reviewed and you will be contacted with your My HealtheVet login details upon approval. 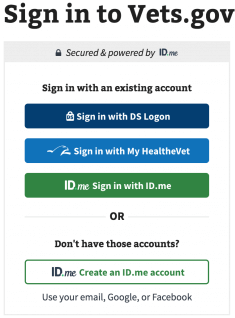 As of March 2018, Veterans can log in to Vets.gov to with their My HealthyVet credentials, DS Logon or ID.me sign in. Therefore providing millions of people with convenient access to a variety of services and benefits with one simple login. This recent development is part of the VA’s continued work towards modernizing their digital resources. In addition, removing any unnecessary hurdles for service members to obtain accurate and up to date information regarding their health coverage and benefits. Read more about this and other developments on Vets.gov on the VAntage Point blog. Often times we pay more attention to our visible wounds and not enough attention to our mental health. VA benefits include resources for veterans to learn more about mental illness and provide confidential tools to aid in recovery. Access the Mental Health Test to help identify symptoms of depression, anxiety, PTSD and other mental health disorders. To learn more about Mental Health treatment options and programs offered to Veterans, Active Duty Service members and their families, visit www.mentalhealth.va.gov. Download the Guide to Mental Health Services for Veterans Families online. 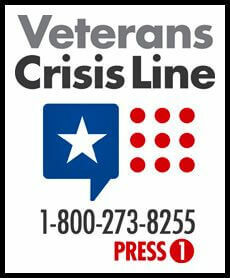 If you are a Veteran in crisis or know one who is, immediate help is available. Call 1-800-273-8255 and Press 1, text to 838255, or chat online. 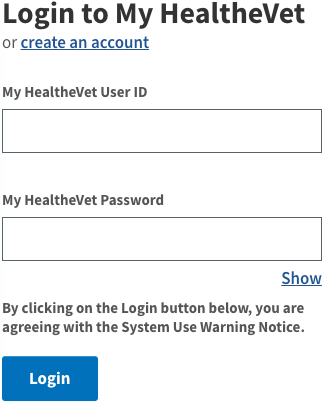 If you are having issues with your MyHealtheVet login, have forgotten your user ID or password – Contact MHV customer support at 1-877-327-0022. NOTE: We are not affiliated with MyHealth.va.gov, and you should NOT contact us with any sensitive information that is of a personal nature. We are merely a resource that provides information. I CAN NOT get my account to open up to request refills. What happened to your site? I am not able to upgrade to premium on-line. Can you assist me with that? I’m trying to order medication from the pharmacy. Prescribed by Dr for my left ear. Why am I being shorted on medication amounts? I served in the U.S. Navy on the aircraft carrier USS Constellation, from 1963 until 1966. I worked as the ship’s librarian just on the other side of the wall from those operating the catapults and jet blast deflectors. Those sailors and all those on the flight deck above were required to wear hearing protectors during flight ops which in 1964-1966 in the South China Sea was pretty much 24/7. Those of us in the library and the adjoining Chaplin’s Office were given no noise cancelling head gear, though there was no difference in noise level for us than for those operating the catapults on the other side of the wall. Since discharge I’ve always had tinnitus (ringing in the ears), but my hearing was OK until I was about 45 or 50 when I started losing it. In my sixties, at the insistence of my wife I looked into and bought hearing aids. They helped somewhat for a while, but the hearing got worse. During a routine hearing exam my audiologist said my hearing had gotten so much worse in the previous year that she said I should see and ENT doctor to see if there was something else going on. I went to the University of Arizona Medical Center in Tucson where it was discovered I had an Acoustic Neuroma (tumor) in my right ear and I had completely lost all hearing in that ear. The audiologist told me the hearing aids I had were inadequate for my hearing loss. She asked if I had been in the military, if I had ever been in a war zone, and if I’d ever been exposed to loud noises. I said yes. She herself wore hearing aids and used to work at the Tucson VA. She told me to contact the VA and look into better hearing aids and partial disability. At this point, I’m not sure where to start and I’m looking for direction. Please advise me where to go from here. GovBenefit.org is a privately owned website that is NOT owned or operated by any government agency.